I am a great believer in the ripple effect of communication. That a word whispered into an ear can cause a castle to crumble or another to appear. I have often wondered, after having had a conversation with a passenger, what effect may eventually be created by that exchange. 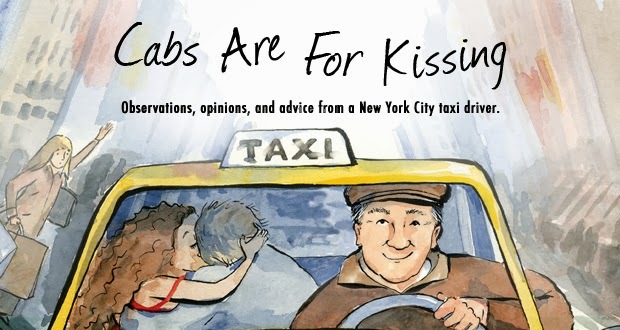 The taxicab is a unique human situation in that it's a business relationship, but its closeness in a shared space, its anonymity, and its protection from external interruptions can create conditions in which real contact can occur. The only trouble, from the driver's perspective, is that you almost never find out what the far-reaching effect of that amazing conversation may have been (although it does happen every once in a while - click here for a story about that). So, even though it's quite unlikely I'll ever know if I've specifically changed somebody's life for the better, I like to think that I improve the world by showing respect to passengers, being a good listener, and occasionally offering what seems to me to be a sage comment or two. And that gives me a needed feeling of having "done something about it". With this great variety of humanity coming and going through his doors, a taxi driver every once in a while finds himself in the sudden company of a certain person who is either known by reputation or is discovered through conversation to be a "key player" in some particular sector of the world stage. The thoughtful driver might see this as an opportunity. "What could I say to this Very Important Person," he might think, "that could create an effect on him and thus on the entire sector of the world in which he is so influential?" Such opportunities are fleeting, indeed. There are only a relatively few moments in which to establish a rapport and make your strike. More often than not, the brilliant things to say are thought of only after the person has left the taxi forever. Many years ago I had such a fare. Its exact location in time is a bit vague to me, but I think it happened in the mid-nineties. I had been cruising down West 43rd Street, approaching 11th Avenue, when I was hailed by two men coming out of the Market Diner. They were Irish - they'd been drinking - (no, I did not say that if they were Irish it goes without saying that they'd been drinking. I would never say such a thing!) - and their destination was 6th Avenue and Waverly Place in Greenwich Village. These guys were around 40 years old and eager for conversation. Rather than just giving me their destination and talking to each other, they engaged me right from the start of the ride, as if for some reason I needed to be convinced of something. It turned out that what I needed to be convinced of was why it was okay for the I.R.A. (Irish Republican Army) to set off bombs and use other violent tactics against the British. Now, I knew very little about the struggle in Northern Ireland other than what I'd read in the headlines. It wasn't my fight and I never considered it my responsibility to learn the history of the conflict or to form an opinion about who was right and who was wrong. The only real contact I'd had with it, in fact, had been from another passenger who'd been in my cab several years prior to these fellows. She was a middle-aged Irish woman who expressed herself about the situation in Northern Ireland with such passion and outright hatred that I'd always remembered her. I didn't remember which side she was on, but I recognized in her emotion that she'd been personally affected by the conflict, quite possibly by the loss of someone who'd been dear to her. I believed that her passion was fueled by a gut-level, perhaps insatiable hunger for vengenance against whichever side had caused her loss and I had gleaned from her an insight into why the conflict never seemed to end. It was an "I hit you, you hit me, I hit you, you hit me" endless cycle of retaliation. From this insight I formed my only opinion about the whole mess and that opinion was that somehow the individuals involved in it had to overcome their desire for retribution and resolve to learn to live together in peace, for the sake of the future. I listened carefully to what my two passengers had to say without challenging them. An angry comment one of them made particularly struck me as being a flimsy justification for violence - "the British cannot be reasoned with!" he exclaimed, perhaps trying to convince not only me but himself that this was so - but I didn't attempt to contradict him or even play devil's advocate. These were serious people who were speaking emotionally and, although I didn't know or want to know specifically who they were, I did know with certainty that they were in the I.R.A. and that they were in agreement with and participating in the activity of killing people who were their political enemies. Some would call them terrorists, others might call them freedom fighters, but whatever you call them, they were scary and perhaps drunk and for my own safety's sake I just wanted to be rid of them. But there was this other thing. It was the knowledge that words can change minds and changed minds can change conditions. So I decided to take my shot. And my shot consisted of a single word. "I have just one word for you guys." There was a pause. They had just spent the last ten minutes using me as their sounding board and were at least for the moment all talked out. So the moment was right. Their facial expressions seemed to say that they wanted to know what this one word could be and, whatever it was, that they would give it their full consideration. So I told them the word. The one who had just given me a ten-dollar bill for the ride seemed a little stunned by the comment. He thought of saying something in response, but he didn't. Then he closed the door and they were gone. After that, time went by. I continued to not give any special attention to the conflict in Northern Ireland but eventually I did notice something. I noticed that things were getting better. And then the conflict was resolved and today no more bombs are being set off. The war is over. Did the comment of a taxi driver in New York City end the war in Northern Ireland? I write this story not only to overstate my worth to the world and to boost up my always fragile self-esteem, but because it is my New Year's message to you, a much-appreciated reader of this blog. I suggest that we resolve to never forget that thought precedes, and is senior to, action and to further resolve to never underestimate the power of communication. Let us resolve to continue to make our voices heard and to always remember that the easiest way to recognize a tyranny is by its attempts to stifle the free flow of communication. And one other resolution, while we're at it: let us all resolve to click here for Pictures From A Taxi. Good stuff GS. The fighting Irish, safe in America sending home money to buy guns and bombs. Glad that that sorry mess has ended. He has donated all of his vast fortune for the good of mankind. I never met a nicer person and that was before I found out about his good deeds. Thanks for your blogs - I have never been to N.Y. but you make it look well worth the trip (from Scotland). Heard about you from a regular reader. Irish problem much improved except for the few extremists still causing trouble. Keep trying to sort the world! Heard about your blogs from a regular reader, truly interesting. The Irish problem isn't over but much much better. Never visited N.Y. but obviousty would be worth the trip (from Scotland). Keep trying to save the world! I used to see "peace and goodwill" on Christmas cards but never really took on the message, until now. I've just read an autobiography written by a surgeon who went with MSF (Doctors without Borders) to help during the Angolan civil war. The horrific story really brought home the idea that peace should be a given for everybody. Your philosophic nature and prosaic soul struck the perfect balance to deliver this astute commentary. Accolades, Gene.